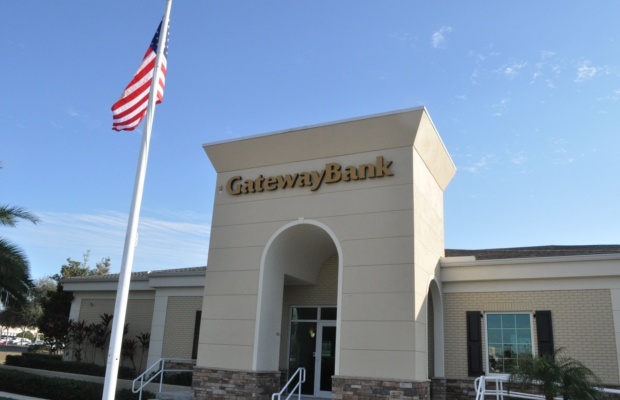 The Gateway Bank of Southwest Florida Project is a major renovation of a 20 year old colonial style bank branch which earned LEED certification. The building was purchased by a local community bank seeking to become a steward in sustainability among banks in the region. The renovation included tightening the building envelope to create an energy efficient shell. R-30 Soy-Based spray insulation was placed at the roof deck. The windows and doors were upgraded to insulated, low-e glazing while the exterior was painted a lighter color to reflect solar radiation and the roof was replaced with highly reflective shingles. Inside, the dated HVAC system was replaced with a highly efficient system. 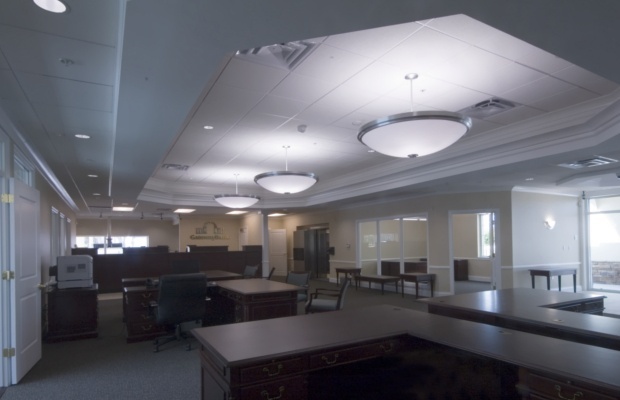 The incandescent lighting fixtures were replaced with efficient fluorescents, all the while; motion sensors were placed to further improve the efficacy of the new fixtures by turning lights on and off depending on actual room occupancy. All the plumbing fixtures were replaced with low flow models to reduce water consumption. Special care was taken to provide natural day lighting and views to the outside from all regularly occupied spaces. All the interior materials, from the gypsum board to the carpets, were fabricated with high concentrations of recycled materials. Even during demolition, the existing wood framing was reused for the new configuration, while the old batt insulation was used inside the walls for sound attenuation. Materials that could not be reused on site were either donated for immediate local reuse or recycled. All adhesives and finishes, including the paint, were specified with no or low volatile organic compounds (VOC’s) known to cause cancer. 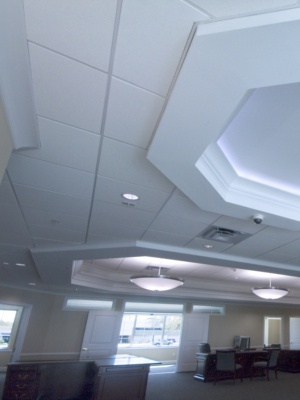 The simple measures outlined above not only provide for a money saving building but also a pleasant space to occupy for the employees and guests. 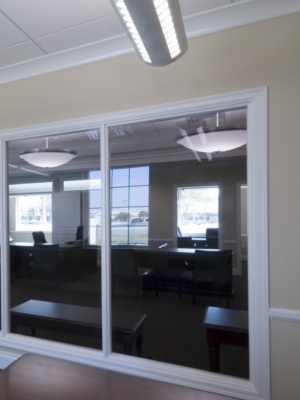 Large windows and interior glazing allow daylighting to pass through the building, as well as providing views to the outside from every office. The mechanical systems were replaced with more energy efficient equipment. 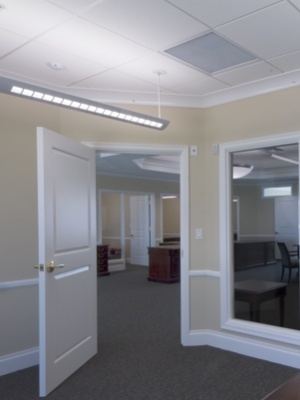 Energy efficient fluorescent lighting with direct / indirect light was installed throughout the interior. 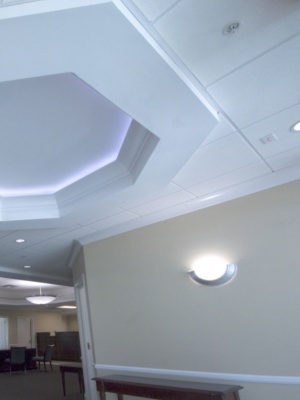 - Compact fluorescent light fixtures and occupancy sensors were installed in restrooms and offices. Low flow plumbing fixtures, low flow toilets and motion sensors were installed for water conservation. Re-roofed with highly reflective shingle roof systeml and increased insulation reduced loads on the HVAC system.